Billy Joss, being a true Scot, was unable to go anywhere without his clubs. So he brought them to the Arctic Circle and started showing off. There's now an annual tournament named after him at the end of July — open to anyone. Golf fanatics, what are you waiting for? During the nineteenth century, Arctic whalers, a hardy bunch by most standards, rarely ventured east of Amundsen Gulf. This was not of concern to explorer Vilhjalmur Stefansson who, in 1911, became the first qallunaaq, or white man, to visit the Copper Inuit people on Victoria Island. Neither then nor in 1939 — when a permanent community formed around a trading post for a booming arctic fox fur trapping industry — was Stefansson or the idle trappers able to find a decent golf course in the area. No putting green, no mini-golf, nothing. A shame, really. In a place where during the summer months the sun never sets, an truly avid golfer could play till he drops. Like the polar ice caps, things have changed. 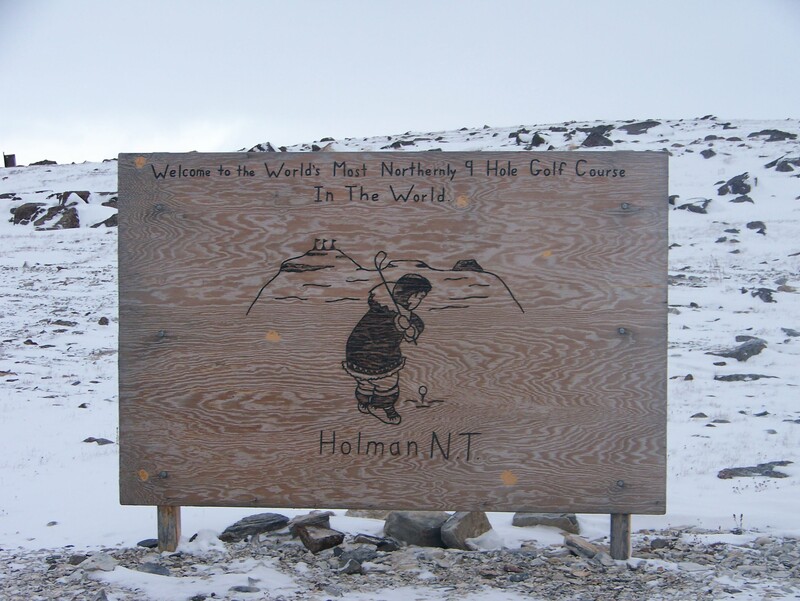 For more than thirty years golf enthusiasts have played nine holes in the hamlet of Ulukhaktok, the most northerly golf course on the planet. If that doesn’t tempt you to hop a plane this weekend, there’s the annual Billy Joss Celebrity Tournament, in the third week of July. 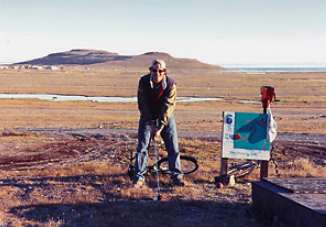 Billy Joss, the Hudson’s Bay manager for the area, being a true Scot, was unable to go anywhere without his clubs, so he brought a set to Ulukhaktok and started showing off. He started with sand greens. Nowadays the nine hole course, a par 33, features verdant artificial greens. The rest is tundra: sand, gravel and some grass. For those squeamish about preserving the pristine condition of their clubs on the gravel, portable teeing mats are permissible. Ulukhaktok means "the place where ulu parts are found", or "a large bluff where we used to collect raw material to make ulus". The ulu is the now fashionable curved knife cherished by foodies in the know. Handy for cutting up several pounds of garlic at a time. “Most people who come to visit Ulukhaktok, if not for business, stay a week or two,” say Joanne. “Other activities are nature walking (2 to 3 hours at the most), hunting, fishing for Arctic Char and Northern Lake trout — from a boat or right from the shore of the Arctic Ocean.” Boats can be rented for $150-$300 a day. A territorial fishing and hunting licenses are required but not difficult to obtain. Accommodation is available at three bed-and-breakfasts and a local hotel, the Arctic Char Inn, for $250 night per person. Any taverns? “Oh, no,” says Joanne. But bottles brought in are not shunned. There are 450 people in Ulukhaktok, known before 2006 as Holman in honour of the J.R. Holman who was part of the expedition to find the Arctic explorer, John Franklin. The population, says Joanne, “80% of whom have lived there all their lives, make a living through arts and crafts, hunting and trapping or employed by the Hamlet of Ulukhaktok or the Inuit community. The community includes an arena, hockey, skating, a curling rink, and volleyball in the school gym. Celebrities of the BJO include various members and alumnae of the Edmonton Oilers hockey team or the Edmonton Eskimos football team. Randy Gregg, who spent 10 seasons with the Oilers and is now a family physician, is a regular at the BJO. The course, at the 70th parallel, is a few hundred miles north of the Arctic Circle, so getting there is not a breeze, and why would we be telling you about it if it was? But First Air, the main jet airline for the North West Territories and the lead sponsor of the BJO, offer substantial discounts on the regular price of a return ticket of $3000 from Yellowknife or $3500 from Edmonton. No doubt about it, this is an appointment with Dr. Green like no other. When your confreres are trading stories about the usual ho-hum spectacularly beautiful and masterfully designed links, toss this one out there. Register here for the 2018 Billy Joss Open Celebrity Golf Tournament at Golf Ulukhaktok — third week of July. WHITNEY SMITH is the Publisher/Editor of The Journal of Wild Culture. He is a poor but amiable golfer. 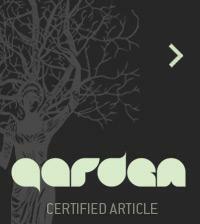 This article first appeared in The Journal of Wild Culture, July 14, 2014. There are strange things done in the Midnight Sun By the ones who play at golf The Arctic trails have their secret tales That would make you smile and loff The Northern Lights have seen queer sights But the oddest they ever did see Was a night in the mist when Whitney Smith Went blastin' off the tee!